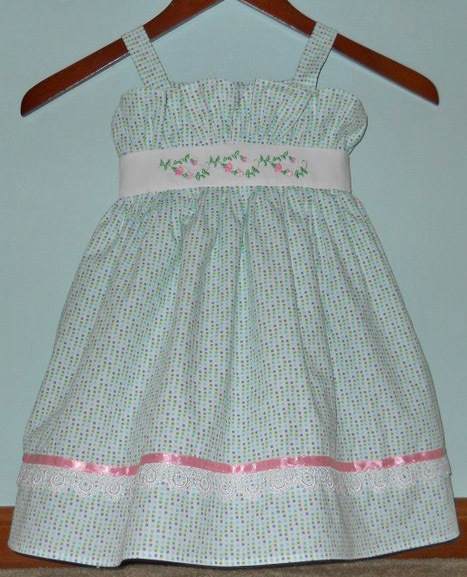 This is a dress I recently made for my granddaughter’s 2nd birthday. I used a Project Runway pattern from Simplicity, then added machine-embroidered detail to the midriff and lace/ribbon on the skirt. All the sewing and serging was done on my BERNINA sewing and serger machines. I used Edgestitch Foot #10 and Rufffler #86 at different times during construction. The fabric was from the Lisette collection at Joann Fabrics and it seems to be exceptional quality cotton. The pattern was interesting… Sometimes there were too many details, then the instructions became “elusive” and encouraged the seamstress to be creative!